Pointing to a strong economy driving demand for products — and in some cases tariffs — some Great Lakes ports are reporting that 2018 saw an uptick in the cargo moving through their waters. Adele Yorde with the Duluth Seaway Port Authority said the only thing that may keep the Twin Ports from another record year for iron ore cargo shipped is a slow start to the shipping season last spring. "We did have some issues with ice. The late March and early April shipments were down," she said. "As the year went by, everything picked up, but those total numbers may not reflect just how strong the season might have been had they been able to move full-strength when the locks opened last March." In 2017, the Twin Ports moved 19.7 million tons of iron ore — the largest cargo volume for iron ore there in a decade. By the end of November 2018, the ports had handled 18.4 million tons of iron ore.
"Whether we can directly attribute it to the tariffs, at least there was strong production, strong demand for the steel-making industry along the Great Lakes," she said. "If you’re going to point cause and effect, I’m sure that there was a definite impact by allowing those steel manufacturers to order domestic product." President Donald Trump announced tariffs of up to 25 percent on steel and aluminum in March. Those tariffs went into full effect in June. 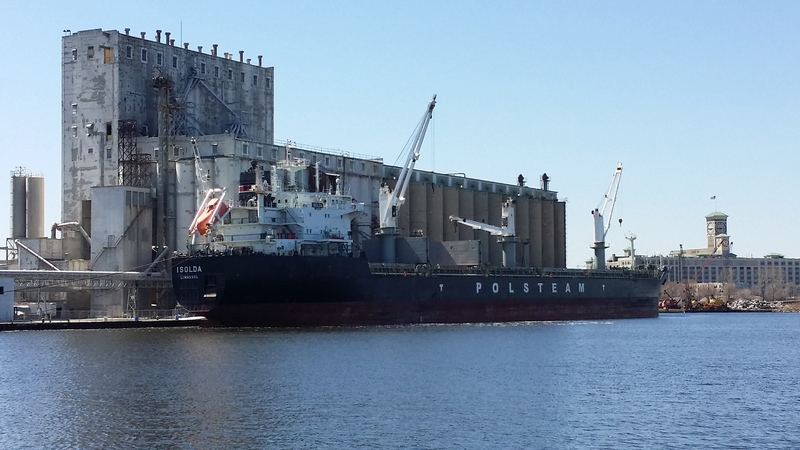 Grain shipments were also up in the Twin Ports about 22 percent from 2017. Yorde said they also saw the first bulk shipment of soybeans after more than a decade as a direct result of tariffs. Typically, Midwestern farmers move soybean shipments by rail to ports on the West Coast or by river barges to the Gulf Coast ports for shipments to Asian markets. China placed a retaliatory tariff of 25 percent on U.S. soybean imports in early July. Dean Haen, director of the Port of Green Bay, said the port has been unaffected by tariffs because it largely handles limestone and petroleum products. "Other Wisconsin ports are dealing with those situations, but we’re not moving aluminum or steel, which are up against tariffs," said Haen. "And, we’re not seeing the export of agricultural products through the Port of Green Bay." The port moved 1.9 million metric tons by the end of November 2018, and was on track to see two million metric tons of cargo or more by the season’s end. In contrast, around 1.8 million tons of cargo moved through the Port of Green Bay in 2017. Haen expects the momentum to continue through the start of the 2019 shipping season. "Once we get to summer, we’ll have to see, but at least the next six months, all indications are the economy is doing well and we’re going to be moving a lot of things by water," said Haen. Meanwhile, the Port of Milwaukee has seen impacts to imports and exports as a result of tariffs. The amount of cargo moved through the Port of Milwaukee in 2018 is expected to be slightly down from 2017, according to Port of Milwaukee director Adam Schlicht. He said grain shipments have been at historic highs in the last five years. However, the European Union responded to U.S. tariffs this year with its own 25 percent tariffs on U.S. products like corn. As a result, grain shipments in the Port of Milwaukee were down 6 percent through the end of November. "But, that sort of encouraged the port to look at other export markets," said Schlicht. "A lot of Wisconsin grain this year from the Port of Milwaukee went to new and developing economies like the country of Tunisia, for example." While inbound steel shipments from Europe remained strong, Schlicht said imports fell 6 percent. "Essentially, the Port of Milwaukee handles specific steel materials that will need to be imported in a global steel marketplace here in southeastern Wisconsin regardless of the tariff environment," he said. Salt shipments at the port were also down about 19 percent from 2017 due to a 12-week strike at a Canadian salt mine in September 2018. However, the port saw a 67 percent increase in liquid bulk cargo. In addition, Schlicht said they saw an overall increase in international cargo, marking the fifth consecutive year of strong volumes. The Port of Milwaukee moved around 2.6 million metric tons of cargo last year with final numbers from the 2018 shipping season yet to be released. The locks at Sault Ste. Marie, Michigan, are set to close Jan. 15, 2019.